A delicious and easy strawberry rhubarb pie recipe is a perfect dessert for spring and summer when these fruits are at their peak. With summer fruits now available to us throughout the year, this sweet tart pie treat is also wonderful any other time of the year too. Combine sugar, brown sugar, flour, cornstarch, cinnamon and nutmeg in a large bowl. Stir in rhubarb and strawberries. Mix well and spoon mixture into pastry lined pie plate. Lay top layer of pastry over the pie and seal the edges. Bake for 10 minutes. Reduce heat to 350ºF and bake for 45 to 50 minutes more until pastry is golden and the filling is bubbling. I don’t know who first thought of mixing strawberries and rhubarb but it is a perfect blend of flavors. The sweet strawberries mixed with the tang of the rhubarb, with a bit of added sugar and spice is a wonderful combination. Put it in a pie crust and you have a bit of heaven on a plate. A perfect pie needs a perfect pie crust and you will find a link to our pie crust recipe below. 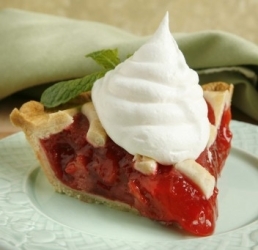 Strawberry rhubarb pie is just one of our tasty pie treats. Find all of our pie and easy dessert recipes here.